Sweet Cart Hire in Canvey Island, Basildon, Rayleigh, Benfleet, Essex. SWEET CART HIRE CANVEY ISLAND ESSEX.CALL 07581018884 TO ENQUIRE TODAY! Our cANDY Cart is by far the most popular across ESSEX. 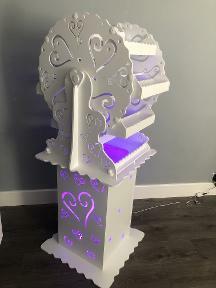 Not only does it have built in L.E.D lights with any colour to choose from to enhance your chosen theme. We at CANVEY BOUNCY CASTLE HIRE have put together an amazing selection of retro and traditional sweets, with some of everyone’s all time favourites being haribo heart throbs, friendship rings, giant strawbs, white chocolate mice, candy pencil, vanilla fudge cubes, large marshmallows, dolly mixture, fizzers, foam bananas, shrimp, cola bottles and much much more! All the sweets are attractively displayed accross the ESSEX CANDY CART in vintage jars to create that special moment. At Canvey Castles we have created 3 affordable packages so you can choose the most suitable one for your event.When renting the are no limits we can cater for as many guests as you require. Each package has been carefully thought of so you can benefit and budget for your event. 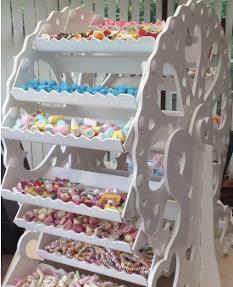 SWEET CARTS IN ESSEX have become more popular over the years with our customers using them for weddings, birthdays, christenings and baby showers. They are a great addition to any event. Just grab a bag and choose your favourite candy! To create that more luxury feeling we can supply attendants who can serve the candy just like a sweet shop! When purchasing one of our products below, delivery and setup will be included in the hire price. All our staff are fully trained to ensure everything runs smooth on the day. To hire please call 07581018884 or simply messege our page. SWEET CART FOR HIRE IN BENFLEET, ESSEX. A great new addition to our hire stock arrived January 2019, our all new sweet ferris wheel which we hire and deliver across Essex. This is a fantastic alternative to our sweet cart. The LED light up wheel offers many colours, also a modern approach to your party as it comes set up on a heart podium or even can be placed on a table. This holds around 20kg of pic and mix sweets which we can supply for you along with traditional stripypaper sweet bags at the colour of your choice! for more information please visit our Essex sweet ferris wheel page. Or call 0758101884 and a member of our team would be happy to help! we deliver hire and rent our candy cart to the follwing essex and london areas. sweet cart hire canvey island, sweet cart hire benfleet, sweet cart hire hockley, sweet cart hire basildon, sweet cart hire southend on sea, sweet cart hire chelmsford, sweet cart hire laindon, sweet cart hire wickford, sweet cart hire upminister, sweet cart hire hullbridge, sweet cart hire rayleigh, sweet cart hire leigh on sea, sweet cart hire colchester, sweet cart hire london, sweet cart hire romford, sweet cart hire dagenham, sweet cart hire barking, sweet cart hire harold wood, sweet cart hire pitsea, sweet cart hire grays, sweet cart hire chadwell st mary, sweet cart hire stanford le hope, sweet cart hire south ockendon, sweet cart hire thurrock, sweet cart hire ilford, sweet cart hire billericay, sweet cart hire brentwood.